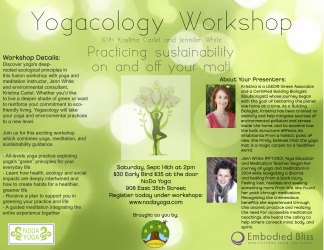 Practicing sustainability on - and - off your mat! Being green isn't something we do – it's who we are. Discover yoga's deep-rooted ecological principles in this fusion workshop with yoga and meditation instructor, Jenn White and environmental consultant, Kristina Carlet. Whether you'd like to live a deeper shade of green or want to reinforce your commitment to eco-friendly living, Yogacology will take your yoga and environmental practices to a new level. Join us for this exciting workshop which combines yoga, meditation, and sustainability guidance. When: Saturday, September 14 from 2:00-4:30 p.m.
Investment and sign up: $30 early signup, $35 at door; Sign up!